Broken Colors follows the life of painter Sophie Marks. Brushed with moments of passion, heartbreak, and longing, Sophie’s journey takes her from World War II England to post-war Paris, to the Italian countryside, the American Southwest, and back to England where she comes face to face with hidden memories. Michele Zackheim was born in Virginia City, Nevada to a young artist from New York and a man who was the principal, teacher, and custodian of a three-room schoolhouse. Michele Zackheim worked as a visual artist before turning to writing. Her work has been shown in numerous museums and galleries. She is also the author of Einstein’s Daughter: The Search for Lieserl and Violette’s Embrace. She lives with her husband in New York. Broken Colors has also been translated into Italian and has been released in the <?xml:namespace prefix = st1 ns = "urn:schemas-microsoft-com:office:smarttags" />U.K. 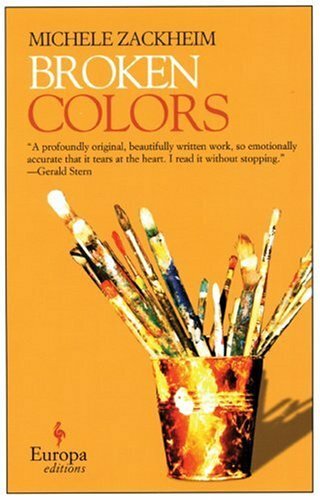 Broken Colors is a novel punctuated by a speckling of quotes from famous authors and writers. Do the quotes help develop the theme of the novel? What is the correlation between travel and age in this novel? Does Sophie’s constant relocating match her shifting emotional landscape, and are the two inextricably tied? Is Sophie in Paris different then Sophie in the American Southwest? If Sophie’s grandfather hadn’t taught her to paint, would she have turned to art as a necessary form of expression? Early in the novel, Sophie meets a fellow painter, Major Roderick, whose face is grotesquely disfigured with partial vision. What is the significance of this character at that point in Sophie’s journey? What was your reaction when Sophie first met Luca? Is it important that they’re both artists? How do you feel about setting art against the backdrop of war and loss? Does it make art feel like a more vital human resource? On page 230, Sophie explains what the term ‘broken colors’ means? Do you think the book is aptly titled? Is this a strong metaphor for Sophie’s life? As a reader, were you rooting for the character of Luca to return to Sophie’s life? Were you surprised by his re-introduction in the latter part of the novel?